I have been hearing about the Obama Administration wiretapping and trying desperately to uncover links of Trump and Putin without success for months. Obama was desperate to blame the Russians for Hillary’s loss. I have warned that Obama’s OFA was circumventing state level Democrats. The rumor mill alleges that this was a Valerie Jarrett operation which was directed from the White House – not the Justice Department as being claimed. The Obama officials are not denying the covert operation, but are trying to paint it as a legitimate investigation of Trump launched by Lynch at the Justice Department to give deniability to Obama. 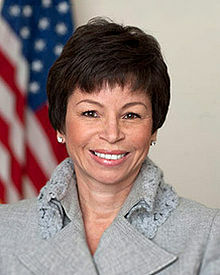 Jarrett was a Senior Adviser to Obama between 2009 up until January 20th, 2017. She is a Chicago lawyer who previously has been tied to Obama and served as a co-chair of the Obama-Biden Transition Project. Jarrett has joined Obama’s effort to help with an “insurgency” movement against President Donald Trump. Rumors also imply that both Chuck Schumer and Hillary knew of this investigation and were briefed, possibly by Jarrett or others in the White House. It is clear that there was a June 2016 FISA request by the Obama administration to monitor communications involving Donald Trump and several advisers. That request was amazingly denied as too broad. The rumor is that the Court was very concerned this was a witch hunt by Obama without any evidence that was akin to Watergate. Then in October 2016 before the election, the Obama administration submitted a new request that was more narrow to the FISA court which targeted a computer server in Trump Tower they alleged would show links to Russian banks. No such evidence was found and indeed it was a witch-hunt. However, the wiretaps continued claiming it was for national security to try to distinguish this from Watergate. NSA Director Michael Rogers participated in the sessions at Intelligence and National Security Summit in Washington. It turns out that Obama officially blamed Putin on October 8th, 2016. Then on Thursday November 17th, 2016, Rogers traveled to New York and met with President-Elect Donald Trump after the election without informing others. Then the next day, the Washington Post reported on a recommendation in “October” that Mike Rogers be removed from his NSA position. This was a recommendation from the Pentagon and the NSA to President Obama that Rogers must be removed. This was delivered to Obama by Defense Secretary Ashton Carter and Director of National Intelligence James R. Clapper Jr. Reuters reported on November 19th, that Carter and Clapper demanded to fire Rogers. Rogers didn’t want to participate in the Obama spying scheme led by Clapper. All the information I was getting from behind the curtain warned that there was indeed a soft-coup against Trump that was organized by Obama and that Clapper was deeply involved. I warned this was being called the “Gang of Four” behind the curtain – absolutely unprecedented. Everyone knows I am very cautious not to get involved in conspiracy theories. Meanwhile, hackers are blackmailing Democrats to release other emails of their covert and illegal actions to overthrow Trump. Reports are surfacing that at least a dozen Democratic groups have been hacked demanding now a ransom and samples of sensitive data in the hackers’ possession have been leaked. One such leak involves a non-profit group using grant money to cover costs for anti-Trump protesters. If that proves correct, there is one non-profit that just committed tax fraud and that will justify 5 years in prison for all involved in that one. There appears to have been an all out effort by Democrats to undermine the government to prevent any reform process of the deep state. We are looking at the complete meltdown of government. The Democrats have gone way too far and they need to clean house or we are looking at the complete breakdown of any decorum whatsoever. 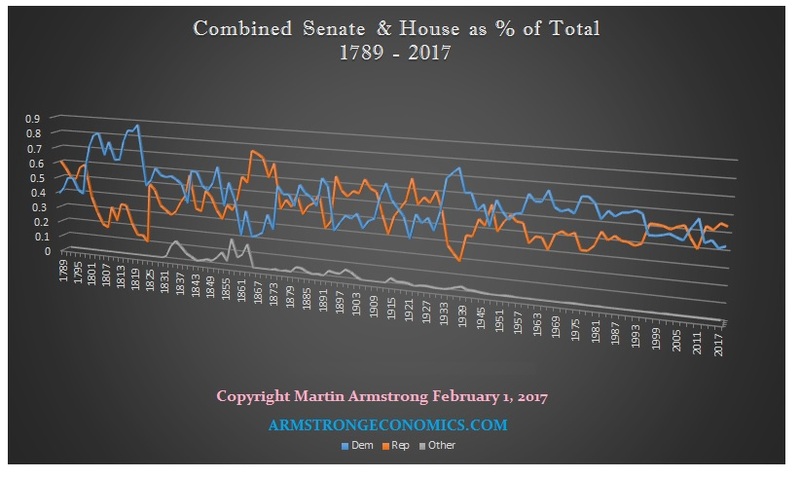 This may be why our computer is warning that private assets are the way to survive – not government. I have warned that our model projected that the Democratic Party was in a major bear market and has been making lower lows and highs since 1932. This is not being partisan or a cheerleader for the Republicans. There is something very very very wrong here and it looks like the unthinkable has taken place. If Jarrett briefed Schummer and Hillary, there is going to be a very serious crisis in government.